Immuno-oncology - triggering a patient's own immune system to attack their cancer - is sweeping through all levels of oncology research, from academia to biotech and pharma. Silicon Valley mogul Sean Parker, co-founder of Napster and first president of Facebook, pledged $250 million to set up the Parker Institute for Cancer Immunotherapy. Pharma and biotech are betting big on immunotherapy also, with significant resources devoted to immunotherapy programs. "In less than 10 years, immunotherapy is projected to form the backbone of over 60% of global cancer management regimens" according to an article by Punit Dhillon of OncoSec. From a preclinical development perspective, how can these therapies be modeled? Typical xenograft experiments use immunodeficient animals, which often lack the key immune cell types needed for efficacy of immunotherapies. Luckily, there are several types of preclinical immuno-oncology animal models which better support immunotherapy research. Syngeneic tumor models have been around for decades, but are experiencing a resurgence due to immuno-oncology drug development. In this type of experiment, a murine tumor cell line derived from an inbred strain is implanted into inbred mice of the same strain background to generate a tumor-bearing cohort. Strains most commonly used include the C57BL/6 (Taconic models B6 and B6JBOM), BALB/c (Taconic models BALB and BALJBO), and DBA/2. While inexpensive and robust oncology research tools, syngeneic tumor models aren't ideal for every project. There is limited cell line availability for some tumor types, such as lung cancer, and species-specific functional differences between human and murine immune systems may make results difficult to interpret. Further, both tumor and immune cells in this model are of murine origin, and some drugs may not recognize the mouse ortholog of their human target. Syngeneic models are most commonly derived from wild type inbred strains, but cancer GEM models can also be used. Cancer GEMs are models in which particular mutations have been introduced to provoke spontaneous tumor development. These models are often designed such that they carry mutations found in particular human cancer types. For example, the Brca1-Associated Breast Cancer Model is driven by tissue-specific deletion of Brca1 and p53 in epithelial cells. Female mice of this strain show a high incidence of mammary tumors that mimic many aspects of human BRCA1-mutated basal-like breast cancer. Cancer GEMs often show delayed and/or highly variable incidence of tumor generation between individual mice of the same model, making study of the cancer GEM itself somewhat challenging. To provide a more amenable experimental system, tumors from a cancer GEM can be cultured and implanted into a cohort of mice of the same background strain as a syngeneic model. Humanized mice open up fascinating lines of investigation for immunotherapy research. Super immunodeficient NOG mice, for example, can accept both a human tumor graft and a human immune system graft, enabling more direct experimentation than syngeneic animal models. There are several proven approaches for engrafting human immune cells into NOG mice, each supporting a different set of study design considerations. One common source of cells is human peripheral blood mononuclear cells (PBMCs), which are easily obtainable from commercial sources. This method supports complex, short-term studies with a human immune component. One strategy that takes advantage of this animal model is a two stage experiment. In the first stage, human PBMCs are directly co-injected with a human cell line. After drug treatment, tumor size and other parameters are evaluated. This first stage experiment provides a low barrier to efficacy in that the immune cells are already co-located with the tumor. In the second phase, the tumor cell line is engrafted first, then PBMCs are injected separately (either intra-peritoneally or intravenously). After drug treatment, anti-tumor efficacy is determined. This second phase experiment has a higher threshold for success, in that it demonstrates the drug can successfully recruit the human cell type of interest from the periphery. The two stage experiment strategy is demonstrated in a recent paper from Roche describing a novel T cell bi-specific antibody. Engraftment of human PBMCs is limited to relatively short term experiments. Mature human immune cells eventually recognize the mouse as foreign, inducing severe graft vs. host disease. Engraftment with human hematopoietic stem cells (HSCs) provides a longer term, stable model of human immune system engraftment. Typically, HSCs are engrafted first, generating a huNOG mouse. Then, the tumor is put onboard, allowed to grow to sufficient size, and treated. Immune checkpoint inhibitors have been successfully shown to induce tumor regression in huNOG mice. For immunotherapies targeting immune cells of myeloid lineages, a more suitable model is the huNOG-EXL. The base NOG mouse has been further genetically modified to express human GM-CSF and IL-3, cytokines important in myeloid lineage commitment. Once engrafted with human HSCs, this mouse supports higher overall levels of human cell engraftment and myeloid cell differentiation. As immuno-oncology researchers are turning their attention to myeloid cells of interest, such as tumor-associated macrophages (TAMs) and myeloid-derived suppressor cells (MDSCs), this tool may be a valuable addition to the immuno-oncology animal model toolbox. Cancer vaccines are a promising avenue for immunotherapy development. Like other vaccines, they often utilize rational design by epitope identification and selection. In silico modeling may be used to identify potential epitopes recognized by the human immune system, but in vivo confirmatory testing is frequently required to confirm immunogenicity. One of the challenges in this area is that epitope recognition varies significantly from species to species, so animal models may not accurately model epitope binding by human HLAs. Mice expressing human HLAs are one way to overcome this hurdle. These strains can be combined with syngeneic tumor modeling to test efficacy of cancer vaccines. 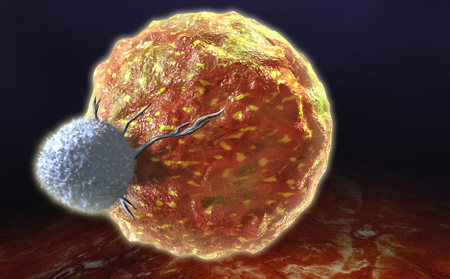 Immuno-oncology brings promise as well as challenges to oncology drug discovery. Although some of the primary oncology preclinical tools are poorly suited to this new field, many other tools, both old and new, can fill in that gap. What do President Jimmy Carter and Taconic's huNOG mice have in common?